Hi guys, Thank you so much for looking after Fred & I. Everything was comfortable & lovely: We wish you well in your new adventure. 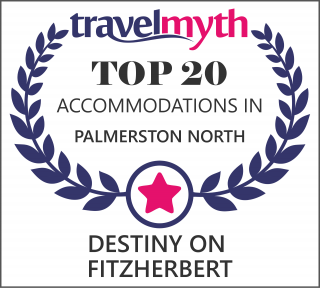 We recently stayed at Destiny Motel in Palmerston North for a few days for a family get together recently. We rented three units. All three were well presented, extremely clean and well equipped. The Manager and his staff were very friendly and willing to help and went out of their way to make our stay enjoyable. I would definitely stay here again when next in Palmerston North. Without doubt the nicest and most hospitable motel I have stayed at in Palmerston North. Well done guys.